This cute vintage valentine includes a head and shoulders illustration of a young girl and Valentine hearts. The girls is holding a small bouquet of flowers. 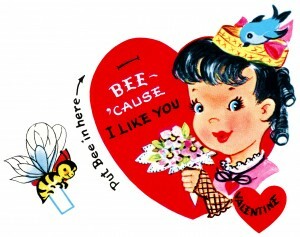 The bee to the left of the girl can be cut out and inserted into a slit made where the black line is above the message on the large heart. The message on the card is: Bee – ‘cause I Like You Valentine. Click on image to enlarge.